Live Creating Yourself. : What if this was Edward Cullen? As I mentioned in the last post, the new remake of The Picture of Dorian Gray starring Ben Barnes (pictured top right) and Colin Firth (Darcy in both the BBC Pride and Prejudice mini-series and in Bridget Jones' Diary) looks pretty fantastic. 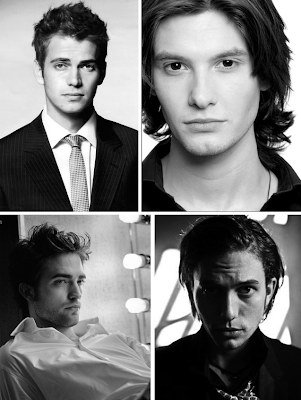 And for all those Twilight fans out there, you'll be interested in knowing Barnes was one of the top 4 casting choices to play the coveted role of Edward Cullen in the Twilight Saga, along with Hayden Christensen (top left), Jackson Rathbone (bottom right who ended up getting the role of Twilight's beloved Jasper Hale), and our leading man, Robert Pattinson. You should do a series on actors considered for big roles. Would be interesting to see who else could have been cast for specific roles...just a thought. I might get slaughtered by the Twihards, but I would have much prefered Ben Barnes as Edward. He is more how I pictured Edward after I read the books. Nathan: I do know quite a few that would shock people. Not a bad idea! Thanks. Love: Agreed about RPatz's looks. Rebekah: I'll save you by saying I'm on Team Jacob. All 7 of us. Hah. I would have to say Hayden Christensen was the closest to what I pictured... don't get me wrong. I do love watching Rob onscreen.